Kern County Sheriff's Office has released details on surrounding an officer involved shooting on the 99 northbound near Seven Standard Road. On August 24 around 12 p.m., CHP received multiple calls about a crash involving a white pickup truck. CHP also received calls about an injured man walking on the freeway with a knife. According to CHP, the driver, Felipe Cases Perez was traveling northbound on the 99 when the vehicle left the freeway, driving through the east fence line across Saco Road, and colliding with a fence and a pole of a business. Perez got out of the vehicle, crossed the fence, and began walking along the 99. An officer arrived on-scene and began following Perez in his vehicle with his emergency lights on. The officer noted that Perez was carrying a knife, appeared to be injured and was acting strangely. Upon investigation, Perez was suffering from multiple stab wounds, which are believed to have been self-inflicted. According to CHP, Perez's behavior was becoming increasingly erratic. The officer then decided to exit his patrol car. He gave Perez commands in both English and Spanish to stop and put his hands up. CHP says that Perez then advanced towards the officer with his knife, at which point the officer fired at Perez. It is unknown if Perez was struck. Perez then jumped over the center concrete barrier and immediately ran into southbound Highway 99 traffic lanes. According to CHP, Perez attempted to enter into multiple vehicles. 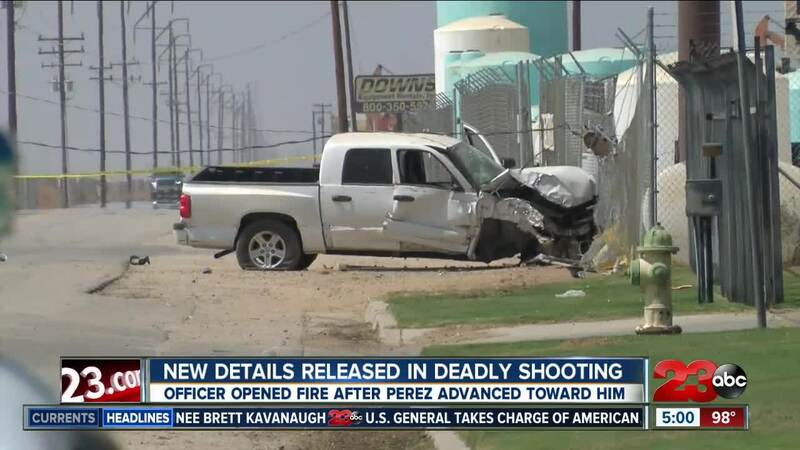 Perez then advanced towards the officer again, who again fired at Perez. Perez was pronounced dead at the scene. The officer was not injured.